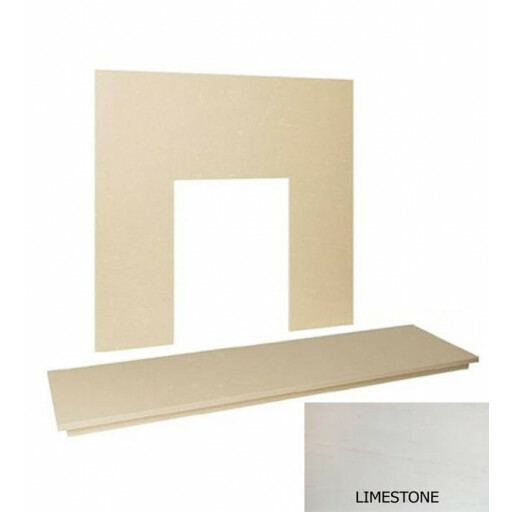 For customers seeking a slightly smaller hearth and back panel set, we offer our 48" "natural limestone" model. Actually made of the finest quality marble, this classy neutral shade will set the mood in your living area and provide a sense of warmth and cosiness to those who gather around it. The design and colour of the limestone hearth will make this the focal point of your room, regardless of your current decor. The hearth measures 1220mm wide,380mm deep and 60mm tall allowing plenty of space to build a blazing fire that will warm the hearts of all those who cosy up to it. This product is well constructed with only the finest materials and workmanship. The back panel comes in 3 pieces to accommodate a multitude of insert sizes. Whether you prefer the cleanliness of a gas stove or the aromatic smell of a fresh wood fire, you will be pleased with the beauty and warmth this lovely hearth will provide. You can choose between a back panel with a standard fire cut-out or a solid panel with no cut-out. You will be amazed how this addition to your decor will change the look and feel of your home. We needed a new back panel & Hearth lovely limestone.